On December 18, 1865, Secretary of State William Seward announced to the world that the United States had constitutionally abolished slavery — the 13th Amendment had been ratified. The ratification of the 13th Amendment, the first of the Reconstruction Amendments, was truly the beginning of the end of one our nation's ugliest and saddest eras. Historically, however, it has always been overshadowed by President Abraham Lincoln's "Emancipation Proclamation." While Lincoln's initial pronouncement to his Cabinet on September 22, 1862, formally tied slavery to the Civil War, he repeatedly stated that preserving the Union was his primary objective — not ending slavery. 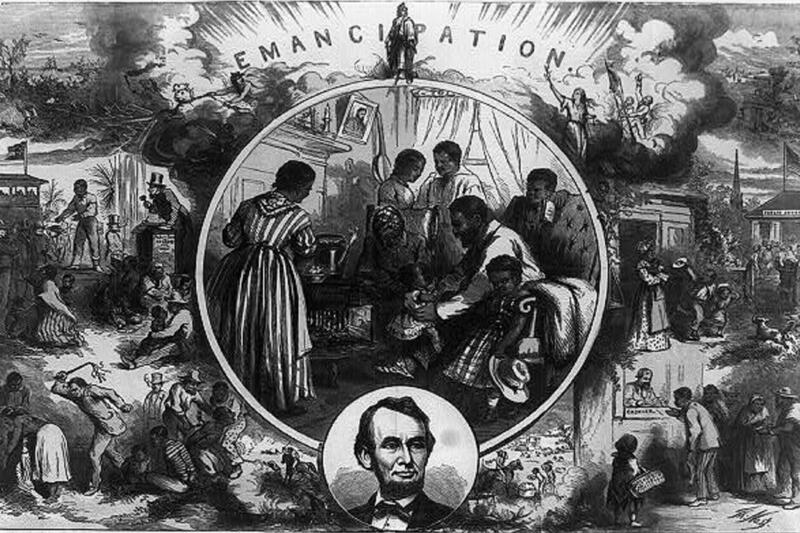 In essence, Lincoln's proclamation — officially signed and issued on January 1, 1863 — freed only slaves in Confederate states where he and the Union Army could not force the issue, but allowed slavery to continue in states where the Union could impose its will. The Emancipation Proclamation was a work of political irony. Lincoln understood slavery was wrong, but did not want to anger the border states that had remained supportive of the Union. However, the Emancipation Proclamation served as a catalyst for abolitionists in Congress to start working in earnest to end slavery in every state. The Proclamation of Emancipation written by President Abraham Lincoln (in office 1861-1865). It began on December 14, 1863, when House Republican James Ashley of Ohio introduced an amendment to ban slavery throughout the United States. Later that month, James Wilson of Iowa introduced another amendment calling for an end to slavery. Less than a month later, on January 11, 1864, Missouri Senator John Henderson, a member of the War Democrats — Democrats who supported the Civil War and opposed the Copperheads and Peace Democrats — submitted a joint resolution also wanting an amendment to end slavery. Now, as civil war ravaged the nation, the legislative battle on Capitol Hill to end the injustice of slavery and treat African Americans as equal citizens was launched on two fronts — the House of Representatives and the US Senate. On February 10, 1864, the Senate Judiciary Committee passed and brought the 13th Amendment to the full Senate. While in the House, one week after the Senate was moving ahead, Representatives took their first vote on the measure. The House vote well short of the two-thirds majority needed to pass, and it was clear the anti-slavery supporters in the House were in for a long struggle. On the other hand, the Senate moved quickly. Senators wasted little time following the Judiciary Committee's recommendation for passage. On April 8, 1864, the amendment was overwhelmingly passed, 38-6, eight votes more than constitutionally required. Four months after the first House vote, in June, 1864, the House tried for a second time to pass the amendment. The vote was closer, but again the abolitionists failed to get the two-thirds majority they needed for passage. The year drew to a close with Lincoln's reelection. Yet the House had failed to produce a bill abolishing slavery. Lincoln's patience with the House was reaching its end. At the same time, abolitionists declared his reelection as a mandate from the people to end slavery. More pressure was brought to bear on the hold-outs in the House to pass the bill. At last, on January 31, 1865, the House passed the 13th Amendment. Though not needed, as a symbolic gesture of approval, President Lincoln signed the document and then sent it to the states for ratification. Initially, ratification seemed a given. By the end of March, 19 states had voted for the amendment. Then the process bogged down, and by April 14, 1865, the date President Lincoln was assassinated, only 21 states were on board. Suddenly, Vice President Andrew Johnson, himself a War Democrat from Tennessee, was in the White House. Johnson was staunchly pro-Union, but he was less passionate about ending slavery. At this point the question was how much support would he provide toward speeding the end of slavery? Abolitionists were relieved when Johnson used his power as the Chief Executive to force Southern states to ratify the amendment as part of his Reconstruction policy. On December 6, 1865, nearly twelve months after President Lincoln had ceremoniously signed the document, Georgia became the 27th state to ratify the 13th Amendment. The three-quarters of the states needed to make the amendment law had finally been reached, and shortly afterward Seward made his historic announcement. 13th Amendment to the U.S. Constitution: Abolition of Slavery. The House Joint Resolution proposing the 13th amendment to the Constitution, January 31, 1865. Enrolled Acts and Resolutions of Congress, 1789-1999; General Records of the United States Government; Record Group 11; National Archives. Sadly, life for Black Americans did not meet the promise of freedom. Southern states adopted "Black Codes" and "Jim Crow laws" — rules and restrictions that by-passed constitutional requirements — and continued to treat African Americans as second class citizens. The tumult and grassroots uprising that eventually spawned such famous legislation as the Civil Rights Act of 1964 is a subject all its own. Today, however, let us remember the tremendous stride that America took 145 years ago with the ratification of the 13th Amendment. Together with the 14th Amendment that afforded African Americans citizenship, due process, and equal rights under the law and the 15th Amendment that gave African Americans the right to vote, a constitutional backbone was provided for what would become one of America's greatest revolutions — the Civil Rights Movement. Video from exhibit "Changing America: The Emancipation Proclamation, 1863 and the March on Washington, 1963"